Perfect fit. Is this coat bespoke? Looks like it! The nattiest Clark Kent to date. Dig his brown-centrism, and the brown-gray meld. A very handsome man and a wonderfully fitting shirt and jacket. Accessories (pocket square) look great. Shoes go perfectly with the jacket color. Bravo! Very nice. I’m trying to figure out what colour those trousers are. I think a dark olive, grey or black would work with this outfit and from the picture, it looks like it could be any of those colours. Very elegant! I love the brown with the black pants. Clark Kent never looked better! Hi, just so you know that I was the person who left you that note about the English Cut blog by Thomas Mahon. It wasn’t Thomas himself trying to appear “anon” in order to advertise himself. In case you thought it was. I love this guy’s style …combination of there great elements: classic, contemporary and personal style ………..in my opinion a recipe for the preffect look. Beautiful ……love love love it all!!!!! Wow. Looks like it’s time for me to get a few 2-button jackets. Incredible fit and incredible look. A beautifully bespectacled specimen. And yes, there are shades of Clark Kent in there, too. My fav parts (outside of the specs)? Pocket square thingie and the shoes. I’m wearing my brown coat and charcoal gray trousers Monday. 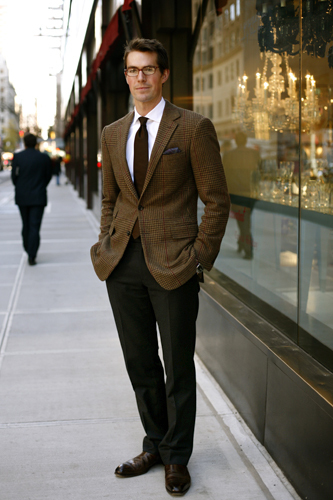 This is a very nicely dressed man. oh!my!,how utterly handsome,he could sweep me off my feet off Madison Avenue any time of the day. A true gentleman in looks. ah, very clean cut. if he turns around, will we see a cape? Impeccable. The eyewear is what really seals the deal. What a good looking man!! He could wear anything and still look good. Wow, I really love it. It’s “Father Knows Best” personified. So classic, i prefer the latin charm. Enough already about C. Kent. He looks like Jonathan Franzen to me. this look is perfect for him. He’s got the LOOK ! His simplistic minimalism is what makes the look so good. Everything has the perfect proportions and the subtlety of his fit makes it stand out for me. I’d definitely notice him if I saw him about. Those trousers are black, right? I’ve seen a lot of black with brown and khaki lately. It’s becoming a look that I could get used too. The only question that I have is, wouldn’t a lighter shade of brown shoe worked better here? Otherwise, the fit is commendable. I think his trousers are a bit long. They shouldn’t be Thom Browne-short, but still. A little shorter would make it perfik! the little bit of magic the gentleman has is called “charisma”. Good Lord! How perfectly dressed is this gentleman?! Is he wearing blue spandex with a red cape underneath? Chic. Dk. brown, black, white. The glasses, the square jawline…working in a big way! Now THIS is personal style. Yes, everything is right, but there is something more here than that. Never underestimate a crisp, white shirt. I kept on wanting to go back to this photo. Great look, tho I have to wonder if he isnt bow legged.